Human Rights Action Center videos provide the United Nations Universal Declaration of Human Rights in English and Persian. Iranian Filmmaker Jafar Panahi Remembered as Absent Jury Member of the 69th Venice International Film FestivalThe 69th Venice Film Festival has opened with a gala ceremony. http://www.persianicons.org/?p=3006 A symbolic empty chair was on stage for the absent Iranian director Jafar Panahi, who was jailed two years ago on charges of acting against national security. Please watch Euronews video report on the event http://www.euronews.com/2012/08/30/venice-film-festival-opens-with-the-reluctant-fundamentalist/ The festival’s grand jury features stars of the screen from all corners of the globe. Other jury members include US director Michael Mann and actress Kate Hudson. They will vote to decide which movie will pick up the Golden Lion prize, the award handed to the festival’s best offering. This year’s event, which runs until September 8, will show a total of 52 films. It kicked off with the world premiere of The Reluctant Fundamentalist, by Indian director Mira Nair. The thriller tells the tale of a young Pakistani man who becomes torn between East and West after the September 11 attacks. American intelligence later target him, suspecting he has links to radical Islamist groups. A symbolic empty chair was on stage for the absent Iranian director Jafar Panahi, who was jailed two years ago on charges of acting against national security. شصت و نهمین جشنواره فیم ونیز افتتاح شد. جشنواره با انتخاب جعفر پناهی به عنوان عضو هیت داوران و قراردادن صندلی خالی این فیلمساز ایرانی در مراسم افتتاحیه، عدم حضور او را به دوستداران فرهنگ و سینما خاطر نشان کرد. جعفر پناهی سال ۲۰۰۰ با فیلم دایره برنده شیر طلایی ونیز شد. او پس از محکومیت به ۶ سال زندان و ۲۰ سال محرومیت از فیلمسازی حق حضور در جشنواره را نیافته است. هیت داوران این دوره از فستیوال مرکب از دست اندکاران و بازیگران سینما از همه جای دنیا است. فیلم افتتاحیه، فیلمی با درونمایه سیاسی به نام “بنیادگرای ناراضی” از کارگردان سرشناس هندی خانم میرا نیر بود. فیلم داستان مرد جوان پاکستانی تبار پس از ۱۱ سپتامبر ۲۰۰۱ را روایت می کند. که سعی دارد در وال استریت مرکز تجاری نیویورک کاری پیدا کند. اما بعدها سازمان اطاعات آمریکا به او مظنون می شود. Polish-born actress and model Katia Smutniak, the event's hostess, in a cherry red dress, declared the fest open after striking a separate, but related, political note. She pointed to an empty white seat on the stage, Venice's reminder to the world, following similar initiatives in Berlin and Cannes, that Iranian helmer Jafar Panahi is still held under house arrest in his country. He was condemned by an Islamic court to a six-year jail sentence and a 20-year ban on directing caused by the content of his films about life in Iran. The 69th Venice Film Festival has opened with a gala ceremony. The festival’s grand jury features stars of the screen from all corners of the globe. Other jury members include US director Michael Mann and actress Kate Hudson. They will vote to decide which movie will pick up the Golden Lion prize, the award handed to the festival’s best offering. This year’s event, which runs until September 8, will show a total of 52 films. It kicked off with the world premiere of The Reluctant Fundamentalist, by Indian director Mira Nair. The thriller tells the tale of a young Pakistani man who becomes torn between East and West after the September 11 attacks. American intelligence later target him, suspecting he has links to radical Islamist groups. بان کی مون، دبیرکل سازمان ملل متحد، در کنار نمایندگان تعدادی از کشورهای جهان، یکی از میهمانان کشور ما در اجلاس عدم تعهد است. سه روز فرصت داریم که قلم را برداریم و گلوی خراشیده از فریادمان را صاف و عزممان را جزم کنیم تا او را که با هزینه و مالیات ما مردم ایران میهمان کشورمان ایران است، دعوت کنیم تا به دیدار همراهان محصور و زندانیان دربندمان برود. او عالی‌ترین مقام سازمان ملل متحد است. آمده تا میهمان مردم ما باشد و ما قرار است رسا و روشن آگاهش کنیم که بخشی از سفر او باید به این دیدارها و رسیدگی‌ها بگذرد. میهمان شهر امروز منتظر راهنمایی میزبان خود است. قلم برداریم و از دبیر کل سازمان ملل بخواهیم تا به دیدار میرحسین موسوی و مهدی کروبی و زهرا رهنورد برود. شما در حالی به کشور ما سفر می‌کنید که بیش از دو سال است میرحسین موسوی، نامزد پیشین انتخابات ریاست جمهوری، به همراه همسرش و نیز آقای کروبی، دیگر همراه جنبش سبز، بدون برگزاری هیچ دادگاه و بدون رعایت هیچ قانونی در بازداشت خانگی بوده و با تحمل انواع مشقت‌ها از چشم مردم و خانواده خود دورند. ما شهروندان معترض ایرانی از شما می‌خواهیم که در بازدید خود از تهران با این رهبران بی‌گناه به بند کشیده شده ملاقات کنید و ما را از سلامت و وضعیت ایشان مطمئن سازید و نیز در دیدار با حاکمان، آنان را به رعایت موازین و قواعد انسانی در برخورد با منتقدان و مخالفان فرا بخوانید و به نقض حقوق بشر در کشور ما اعتراض کنید. Please sign the following appeal to the UN Secretary General Ban Ki Moon, by copying and pasting the following secure link to your browser. PLEASE SHARE WITH AS MANY PEOPLE AS POSSIBLE…. TIME IS OF ESSENCE! 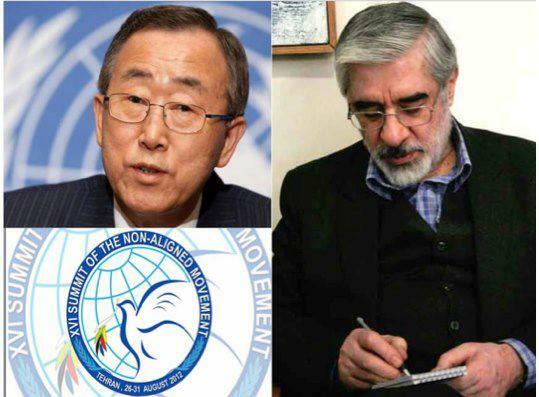 Your visit to our country coincides with the more than two year illegal house arrest of former presidential candidates Mir Hossein Mousavi and Mehdi Karroubi and Mr. Mousavi’s wife Dr. Zahra Rahnavard. The companions of the Green Movement have been under house arrest in the absence of a trial, without an indictment or adherence to the rule of law. They have endured much hardship while being render incommunicado and have been isolated from their family and loved ones. We the protesting Iranian citizens, request that you visit our innocent and detained leaders during your trip to Tehran in order to verify and confirm their condition and well being. Furthermore, we ask that in your meetings with the ruling establishment, you call upon them to adhere to their obligation to uphold human rights standards and principles when dealing with their opponents and critics and condemn all human rights violations taking place in Iran.